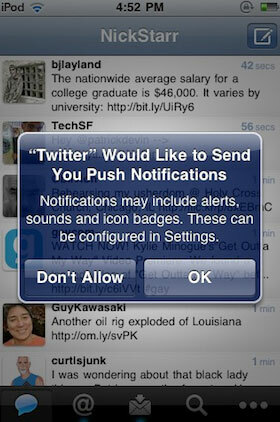 Twitter just announced in an email to all major tech blogging services that they’re currently testing push notifications for iPhone and iPad amongst themselves and the feature will be made available to users soon. 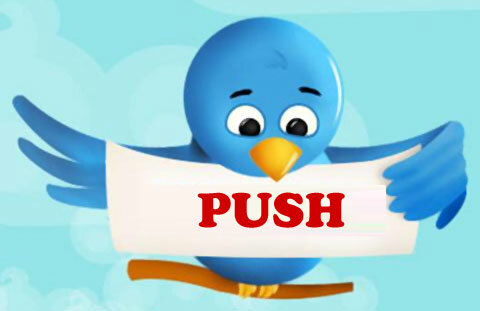 When we launched Twitter for iPad, there was a configuration error that caused us to offer push messages to a small set of users. We’ve stopped sending push messages, but users may see an option to turn on push until we release an updated version of the app. We’ve been testing push notifications internally. Push isn’t ready yet, but we look forward to rolling this out soon. Twitter for iPhone was originally called ‘Tweetie’ when it launched 3 months ago. It’s currently one of the most used Twitter interfaces with 8% of all iPhone users accessing their Twitter accounts through the app.